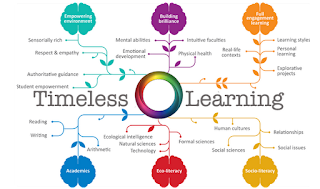 Timeless Learning (TL) is a non-profit, equal opportunity, educational organization with no political or religious affiliations. We are active participants in the creation of a new educational paradigm, and developing a holistic learning system based on balanced development, following individually unique growth cycles. TL’s mission is to empower people of all ages to find fulfillment, personal responsibility and core-life purpose. Our unique blend of academics, meditation, exercise, breathing techniques, healing modalities, fine arts, outdoor skills, and advanced technology information help us achieve this. By providing a learning system based on “whole-person” development, catered equally to mind, body and spirit, we co-create the foundation for a life filled with peace, health, abundance and harmony for all. We believe the future of humanity lies in empowered acts of personal and co-creative inspiration that lead to the enhancement of the lives of the entire community. We will be starting an Open Source Curriculum Project so that you and individuals around the world can share class ideas and personal wisdom with millions of others. This Open Source Curriculum will be built on top of our established foundation, and curated by a team of educational experts, to create an expanded and elevated learning experience for all students. 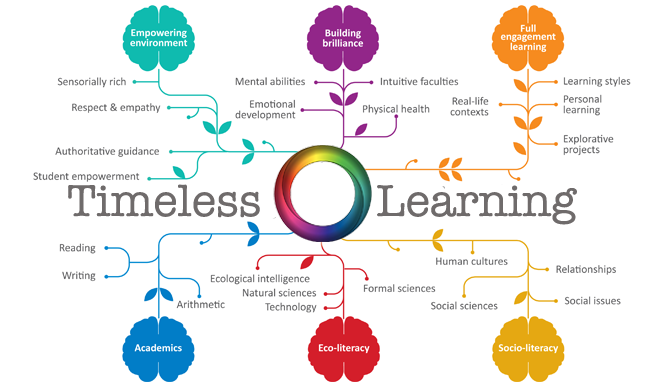 Globally enriched, balanced curriculum based on social, ecological, academic, physical and energetic aptitude, that challenges the students at all levels of development, is a big part of the “New Now” learning system and radical reinvention of educaiton. Support Growth of Timeless Learning Vision; Give the gift of unlimited purpose, passion and potential to everyone, everywhere at everytime! Imagine everyone receiving the best support possible to discover and share personal brilliance. YES, we are all extremely talented at something, many things actually, and for us all to thrive, each person must be supported in sharing these gifts. By teaming up with world leaders and philanthropists we seek to provide this joyful path of life learning to all people regardless of social standing or household income. We are gathering a round table of advisers to assist us in the full-scale creation of a new educational paradigm. Individuals we would love to partner with include: Bill and Melinda Gates, Sir Richard Branson, Sir Ken Robinson, Oprah Winfrey, Warren Buffett, Jerry Mintz… to name just a few of the top on our list. We are currently looking for philanthropists and partners to align with for the growth of the Timeless Learning System. Please contact us if you are interested in growing this vision together. With the educational systems of today, it can be incredibly difficult to keep students connected to, and excited about the truly adaptive processes of learning. In this age of rapid information transfer, the mainstream educational model shows itself to be an imbalanced and limited system due to its primary reliance on outdated book learning, its test-oriented instruction, and very limited hands-on experience. Students most precious gems, imagination and development of authentic personal creative expression, are suppressed and replaced instead with expectations to receive “a good letter” on prescribed assignments. These processes imply and foster perpetual increases in stress due to the system’s inability to authentically customize the education to the requirements of the highly gifted youth of today. These aspects of the outdated education paradigm are exacerbating a core problem in the framework of the cultural & intellectual output of society; the solution is to rejuvenate it through a true cooperative learning initiative catered toward a new educational paradigm . Through holistic life empowerment, we exemplify a lifestyle to our peers and children, that addresses the pressing challenges of today, and prepares the next generations for a rapidly changing world. Our replicable learning center model and curriculum, for the complete human experience, is founded on a simple celebration of what we are capable of as inspired co-creators of reality. We are here to embody, share and evolve sustainable lifestyle practices, global contribution for the restoration of a harmonious world culture, mutual respect for the dignity and worth of each individual, and an honoring of the responsibility for healthy stewardship of the Earth. To fulfill our mission, of co-creating the birth of a new educational paradigm, and a premier learning system for the world, we will use of ourTimeless Digital Ecosystem; an online and user-friendly content delivery platform. In the short-term, the ecosystem will offer educational videos, E-books, articles, blog posts, virtual coaching and live-streaming media, sourced and created from our onsite events and educational curriculum. In the long-term, we will distribute our K-8, high school, and adult curriculum to a rapidly growing home school marketplace. This will be available for lease to aligned educational partner organizations who share the Timeless Solutions vision. Broken into several phases, our initial beta-release is scheduled for 8-12 months, with our Ph.D Curriculum Developer and team of education specialists continuing to develop and refine our education system throughout 2012. By creating a network of E.A.R.T.H. Eco-communities, our students will have the opportunity to directly engage with the new paradigm that we are choosing to enliven. These centers offer the space and resources to practice and embody the wealth of different skill sets, crafting abilities, and lifestyle choices, available to the modern sustainable culture. By living authentically from this dynamic intention, we will create hands-onprogressive educational material that is rooted in joyful self-discovery. By showcasing the best Permaculture and Biodynamic Techniques, Renewable Energy Technologies, Eco-Architecture, Personal Development, Water Purification, along with many other subject matters, our E.A.R.T.H. communities facilitate an educational experience on the tangible “how to’s” for sustainability and thrive-ability, becoming extensive solution-sets to remedy the instability and in-sustainability of the previous post-industrial educational era. By implementing sustainability as its core operation, Eco-villages can address unsustainable practices directly and impeccably, thereby providing efficient solutions to the problems & challenges of outdated social, educational, & industrial models. Eco-villages become incubators for the world’s leading cultural creatives in this way, and provide a space for educators & inventors to showcase this newly thriving society. Each community features unique educational nodes & offerings based on that site’s staff expertise, ecology, and infrastructure, furthering the growth and adaptability of this replicable community template. Through our learning environments, students will learn to embody the integrated knowledge & wisdom of dozens of different practices, which include: conscious communication, body awareness, ecology, self-reliance, music & arts, and personal empowerment. Our fundamental courses will include proficiency in a range of skill sets to include: English/language arts, science, mathematics, history and social sciences. In addition, students will develop life skills through community involvement, use of modern technologies, personal accountability practices and awareness of holistic healthcare. Based on the cultural practices of indigenous peoples, children will be encouraged to thrive on their individual sacred learning path through the completion of distinct rights of passage. During these times, students will be taken on vision quests and publicly recognized as stepping into the next level of being. In addition, students graduation of consciousness levels will noted through special ceremonies in which they receive awards such as handcrafted Native American flutes at age 7 and iPads* at age 10. This program is overseen by our Curriculum Director, Dominique Del Chiaro who has a PhD in Rights of Passage, under Transpersonal Psychology. Ongoing schooling through partnership with conscious higher educational institutions (Gaia University, Wisdom University, HeartMath Institute). Assistance in fostering relationships with other graduates to join or start a community enhancing business or organization, such as opening Timeless Centers in their hometowns. Additionally, work options with Timeless Learning affiliated enterprises will be offered (based on skill-sets and availability). The time-tested practice of apprenticeship is with one of our global network of mentors to allow ease and grace in finding success and fulfillment immediately in the context of the greater world community. Our degrees will be a personal guarantee of a student’s extraordinary life development in a balanced and socially integrative way. Timeless portfolios summarize a student’s learning path and contain teachers input regarding the student’s strengths, passions, classes attended and core purpose in life.